Making your own Christmas costume can help get you into the holiday spirit. 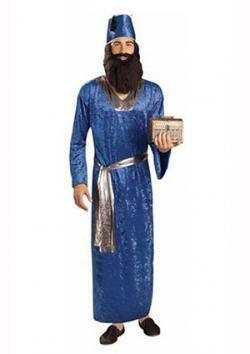 The type of costume you may need will depend on whether you're celebrating the religious holiday or Santa Claus; luckily, there are easy ways to put together both types of costumes. It's easy to learn how to make Christmas costumes for a nativity play. 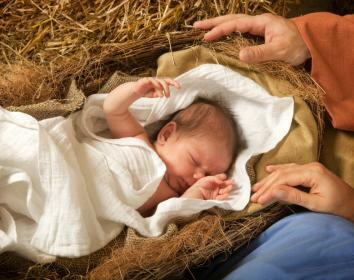 Baby Jesus, shepherds, Joseph and Mary are the easiest costumes to make. Make these nativity costumes from items you may already have around the house. Angel costumes can be as dramatic or simple as you want to make them. Wings are not necessary, and halos can be worn around the forehead or suspended above it. Put on the white dress or nightgown. Loosely trace the shape of a wing onto each piece of cardboard and cut it out. Cover the wing shapes with glue on both sides and glue the feathers on. Punch a hole into each end of the wings where they will "attach" to the back. Thread wire through the holes and twist the ends of the wire together to hold the wings together tightly. Have an assistant hold the wings in place between the shoulder blades while a second person wraps long elastic casing over the wings, over the wear's shoulders and under the arm pits, tying the ends together tightly to hold the wings in place. Bend a piece of wire into a circle that fits comfortably around the wearer's head. Cover the wire in glue and feathers. If desired, a second piece of wire can be attached to the halo and to the wearer's shirt so it floats above the head. The simplest costume to make is to swaddle him in a large, square white or off-white blanket. Lay the blanket down in a diamond shape. Fold the top corner down and set the baby on the blanket with this head above the folded corner. Gather the left side of the cloth and pull it across his body tightly, tucking it under him on the other side. Gather the bottom left of the cloth and pull it up and across his body, tucking it under him. Gather the remaining fabric on the right and pull it across and down, tucking it below him. Joseph's costume is very simple to make. Put on the robe and tie it closed around your waist with the rope. Place the cloth or pillowcase on your head so it pulls tightly across the forehead and falls down the back. Secure it with the headband around the center of the forehead. Mary's costume is also simple to create. Put on the nightgown with the robe open over it. Place the pillowcase or cloth on your head so it covers the forehead and falls down the back. Secure the cloth around your head with the headband. The shepherd's costume is the same costume as Joseph's, with the addition of a shepherds staff or crook. Kids can make their own shepherds crook for a family nativity play with empty wrapping paper tubes by bending one end of the tube into a cane shape. The wise men have a simple costume as well that is accentuated with props. Put on the robe and close the front so it fits loosely. Put on the sandals and crown. Carry a prop as a gift, such as a wooden box or glass bottle. Animal costumes can also be a simple or creative as you want to get, depending upon which animal you choose to be. Cut out several circles from the black felt and glue to the white shirt and pants. Unravel one end of a cardboard tube, and twist the cardboard back up tightly to form a point. Glue into place and repeat on the other tube. Cut a slit into the bottoms of both tubes and thread a headband through the tubes so when the headband is put on, the tubes stand up straight as horns. Wear with black gloves and shoes. Glue the cotton balls packed tightly together onto the shirt and pants to resemble the wooly coat of a sheep. From toy soldiers to elves, to Mrs. Claus and Dickens characters, there are countless other ways you can dress up for the holiday. Get your props together and try any of these fun and easy to make Christmas costumes. Dress as Santa - the head elf - using these simple instructions. Cut long strips of the faux-fur and glue them to all the hems on the robe, including the sleeves, collar, front and bottom. Cut and glue strips of the faux fur to the bottoms of the sweat pants. Put on the sweatpants and white shirt. Tuck the pillow up under the shirt and tuck the shirt into the pants to create a rounded belly. Put on the robe over the shirt. Finish with the black boots, a Santa hat, wig and beard. Head out dressed as Frosty to any holiday party. Cut the bottom out of the pop-up clothes hamper and pull the sweatshirt over it to make the sweatshirt stand out. Glue loose pillow or upholstery stuffing over the entire sweatshirt, including the hood. Use enough to really round out the hood and body of the sweatshirt. Put on the white pants and the sweatshirt with its hamper frame. Put the hood up. Place a black hat on top of the hood, tie a scarf around your neck and hold onto a broom. 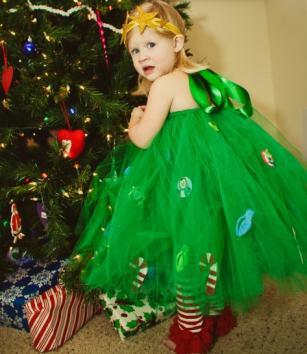 A Christmas tree costume is sure to be a big hit no matter where you go. Cut a piece of long elastic so it fits comfortably around the wearer's waist. Tie the ends of the elastic together. Cut the tulle into strips of varying lengths. Tie the longest strips of tulle onto the elastic so they cover the elastic completely and fall down like a tutu. Tie the next longest strips of tulle so they lie on top of the first set. Tie the shortest strips of tulle so they lie on top of the others. The effect will be a skirt that stands out away from the body. Stitch the tops of several bulb ornaments onto the shirt and tulle shirt. Remember to leave a space in the back bare so you can sit down. Put on the brown tights and green shirt and pull the skirt on top. 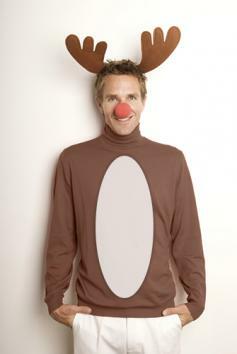 Get a group together to go as all nine reindeer. Put on the sweatpants and sweatshirt. Cut a large white oval out of the felt and glue it to your front so it covers you from your chest to the bottom of your torso. Put a small amount of black or red face paint on the end of your nose and don a pair of antlers. This is a fun costume to wear, particularly if you are going with a friend dressed as a Christmas tree. Cut the bottom out of the cardboard box so it only has a top and sides. Wrap the box, leaving the bottom open. Cut a large hole in the top of the box big enough for your head to go through. Cut holes in the sides of the box for your arms. Put on the pants and shirt and put the box on over them with your head and arms coming through. Dressing up in Christmas costumes adds a special touch of jolly to the season. 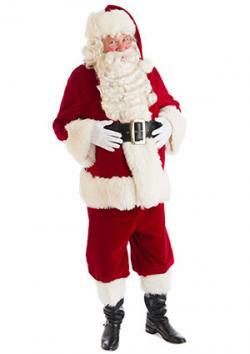 You are bound to be the hit of the holiday party dressed up in any one of these Christmas costume suggestions.